PSB: Hi Neal, so the draw is now out for the Crucible and before we take a look at the four sections, do you have any initial thoughts on how the draw looks? 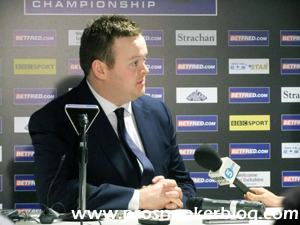 Neal Foulds: I think that the first thing to say is that Neil Robertson is in a pretty good section it seems. Of all of the four seeds he looks to have the best overall draw I think and as is often the case the bottom half looks stronger than the top, that was when just the seeds were laid down really. I think Robertson will be secretly quite pleased with the section of the draw that he is in, playing Ali Carter who we know has had his problems and we don’t know how well he is going to play. He has got a great record but the fact is that Robertson is the best drawn of all the players and I’ve fancied him before at the worlds since he has won it and he has been slightly disappointing. The toughest section I think is the one with Ding Junhui, John Higgins, Marco Fu and Judd Trump, the third quarter for me. 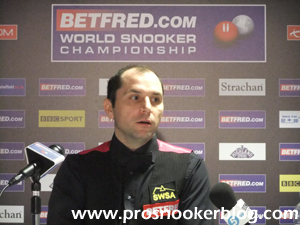 Neal Foulds: I was really pleased for Kurt Maflin actually to get through because he is a highly rated player and he is a bit of a quiet man. Even when he has done well at the Shoot Out they have never gone to interview him in any of those matches that he has won, he is someone who has gone a bit under the radar, but I know that the people who practice against him say that he is a really good player. I think Selby won’t be disappointed with his draw, someone who is fairly inexperienced at that level and if he could draw someone on the first day, that is fairly tailor made for Selby’s game, Maflin was the one. He could frighten him a bit because he is a frightening sort of a player, he is capable of scoring. He is an unpredictable player, he hasn’t got the best cue ball control in the world but he can pot his way out of trouble. I just feel that Selby will be pleased enough with that draw. I don’t necessarily think that Selby will win it this year for a number of reasons, there are so many curses on him it is untrue! But I think he has got a decent draw. I don’t foresee the champion going out on the first round as we have had in the past here. I think he will win. PSB: How relevant do you think it is that Mark beat Kurt recently in the semi-finals in Beijing? NF: Yeah I think it is because that was a good game and Maflin got into the match early and he had chances, but he didn’t take them. I think that will play a part and if Selby starts well, I think he will win by about two frames to one really, 10-5 something like that. But I hope Maflin plays well. NF: The thing is Maguire fits into the category of a lot of players who have been so busy in the last month trying to get their ranking. I know most players have played in most of the tournaments anyway but you look at what has happened to Martin Gould and what happened to Michael White, they have been all over the place desperately trying to get enough points to get them in the top 16 and they never got out of qualifying. McGill made a brilliant break in the decider yesterday and I reckon that there is a real chance of a shock there. Maguire was under pressure to get there and I don’t underestimate him at all, but if you look at the first round matches, I am sure that those two know each other pretty well also, I am sure that McManus has practised with them both, so on that basis these two probably know each other’s game quite well and so I think McGill has got a real chance in that. I think it could be a real close one and I wouldn’t be surprised if McGill beats him. I don’t think it is a draw that Maguire would have wanted, playing somebody that he knows well, a fellow Scotsman. They are not dissimilar in their styles really, I think McGill might be a little bit slightly mechanical, he has got a very straight cue action so if you are looking at first round shocks, that is a possibility I think. NF: Yeah he loves him, he is always speaking highly of him and I know one thing, he puts in a lot of hours and he has developed as I said, this dead straight cue action and he’s just a really good little player. He’s not as naturally gifted as some of the youngsters, but I think he is a good player and I like him. Despite not really knowing him, I like him and I think that he can go a long way. People talk loosely about future world champions and I don’t think that he is as good as that, but he is someone who could get into the top 16 and win a ranking event, he’s a pretty decent player. 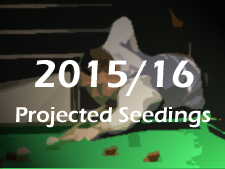 Put it this way, if I was looking for a first round accumulator for the seeds, I wouldn’t put Maguire in. NF: Yeah I think Joe Perry has got a good draw, Zhang was 9-7 down against Liang Wenbo and I did the commentary on the first session, it was very scrappy. 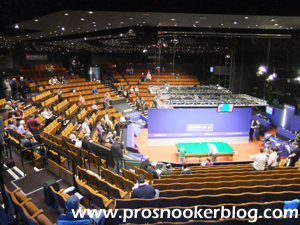 I don’t know how good the table was because I watched Matthew Stevens and Joe Swail on that table earlier and I don’t think that the conditions were perfect personally, they didn’t look good. At least Zhang has the experience of having played there before when he had Stephen Hendry beaten and Hendry raised his game at 9-7 down I seem to remember, I commentated on that one for the BBC. But I think he is quite limited, he is a good player, very reminiscent of a lot of the Chinese players, they work hard on their technique. There are exceptions but I don’t think that he is as gifted as some of them and Joe Perry must be feeling great about things and will win that one fairly comfortably. Joe has won a ranking event now and is almost on his second coming, because he went off the radar a couple of years ago where you didn’t see him on the television for a long period. 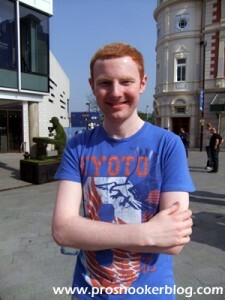 I suspect now he will expect to win that game and I am pleased for Joe to win that ranking event. NF: Yeah, Murphy has been great all season, although I did sense recently when they were travelling around that he has started to show signs of being under pressure. He made a few comments about conditions and getting involved in this whole business about the kicks. I think lately he has been showing certain signs of fatigue. Now if he can block that out of his mind then he is going to have a great chance this year. I would have thought about six weeks ago the way he was playing, the way he was cueing, but it all seemed to come to a halt at the World Grand Prix where he didn’t play well and he lost his cueing and never potted a long ball in the entire match against Peter Ebdon. But maybe he lost his game at the right time because he has got a cue action that can last the 17 days as he proved when he won it. I would expect him to win, but I would never underestimate Robin Hull because one thing you know about Robin is that if he hadn’t have got ill, he was on his way to the top 16 then and effectively he is a top 16 player that never happened through no fault of his own. He is a really good player, a heavy scorer and not anyone that you should underestimate. He has got the experience of last year and it could be close. Let’s be honest, Murphy can get beaten by people, remember when he lost to Jamie Jones surprisingly and I still don’t think that he is the best tactical player around. But he has got that confidence about him. I think he will win, but it could be a close game. PSB: So for this quarter, is there anyone in particular that you fancy to come through? 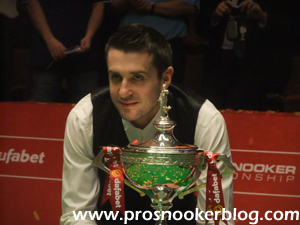 NF: I think it would be between Selby and Murphy, obviously Joe Perry has played well at the Crucible before, has been in a semi-final in 2008. He would be the dark horse in that quarter but I don’t see too many shocks as such, I think that while you have got McGill in there who could beat Maguire, I don’t think that any of the qualifiers will get too far. I don’t think that Selby will win the World Championship so I will go with Murphy in that quarter, if he can show signs that he is cueing as well as he was a few weeks back. PSB: So moving on, we have Barry Hawkins against Matt Selt at the top of the second quarter. NF: Hawkins is another once, since he lost that match in the UK where he was 5-0 up against Nigel Bond, he has been struggling. There were some glimpses of him coming back to form I thought in Beijing, he played better and you can’t deny that he comes to the Crucible on the back of a final and a semi-final, he has got great memories of the place and I expect that he will play a bit better than he has because he has been terrible. Hawkins has got such a nice temperament and is such a nice lad, like a few others, like Murphy, he has just shown a few signs that his brain is a bit scrambled recently. I would expect him to beat Selt, obviously Selt had that remarkable match against Jimmy White where he was 7-2 down and had a Twitter meltdown and came back and won, so he has done well there and he has been at the Crucible before which helps him. 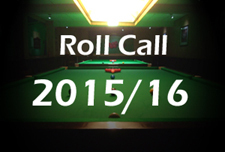 But I would pin my faith in Barry Hawkins back at the Crucible playing better again having struggled for a long time. It might be in his favour that he has not been winning because the UK was in December now and he is going to get his game back. When players have good Crucible records, they don’t want to give that away and I expect him to win. NF: I don’t think that the next match is particularly easy to call, the Mark Allen and Ryan Day match, Ryan has breezed through his qualifier there and has a fair record at the Crucible, has beaten Ding there and matches like that. Mark Allen has been quiet, he is someone that if he can get through this match, could be a little bit of a dark horse. I’ve been waiting for him to spring into life for a while but he has not been doing it has he? NF: I think that if I could pick the three qualifiers if I was in the top 16 that I wouldn’t want to face, I wouldn’t want to play Ryan, I wouldn’t want to play Matthew Stevens, who I know is not the player that he was but he is back at the Crucible and warmed up after three matches. 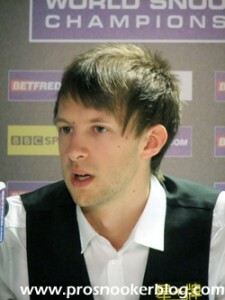 And I probably wouldn’t want to play Graeme Dott to be honest, so I think that Allen has got a tough opener there. You mention that the head to head is tight, again I think it will be a close match. 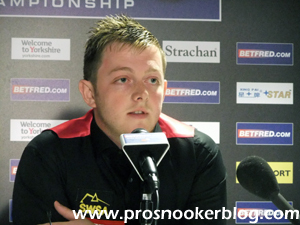 Mark Allen is a very aggressive player and if it gets close I would fancy him to come through that. In that quarter Allen for me is the only possible danger for Neil Robertson. 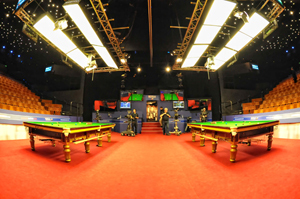 I don’t think that Hawkins is playing well enough to go all that far and a fired up Mark Allen could be quite dangerous, so if he can get through the opener perhaps we will see him play better. He has got quite a good pedigree at the Crucible, he has had his downs there but he has had quite a few good matches there as well, beating O’Sullivan. Providing he is still as good as he was – I’m not so sure about him – his cue action is his own and as long as he gets himself up for it, it might just be a good draw to be up against somebody who will test him. NF: It is the most difficult match to call. I don’t know how Ali will play, he has been in the final twice and loves it at the Crucible, but he didn’t play in India, he had visa problems and we know that his seeding has been frozen which was the right thing to do, but he’s had a quiet season as you would expect really with the illness that he has been through. However when he reached the final in 2012 he came into the tournament with no form so I wouldn’t underestimate him. Alan will probably feel like he has got a little bit of a chance having got through for the third year running and he did particularly well last year with that win against John Higgins on his way to the quarter-finals where he lost to Selby. That is a really tough game to call, I suspect Carter might be too strong, but only just. That could go all of the way and be a really tight game in so many ways. I hope Ali plays well, he deserves a good run there. The WPBSA were kind to him which is fair enough, but now it’s down to him and he has got to prove himself on the table and it would be great if he won. It’s an awkward one for me because I get on great with Alan but I suspect that Carter might just get through that one. NF: Jamie Jones had that year where he played well and reached the quarter-finals at the Crucible and now he looks like he is playing better because he had a poor season after that. I’m not sure how well he is playing, to me it’s all about how Robertson plays there, if he plays to his best I think he will win. My only concern about Robertson, who I think is someone who could win the tournament, is that he has gone a little bit too negative for me. 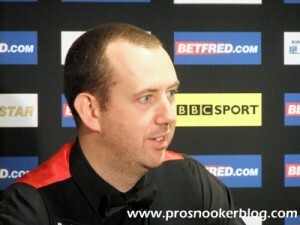 The 82 minute frame that he lost in Llandudno against Mark Davis, he never took a risk in the whole frame, not one. Even when he potted the pink and played a negative safety on the black. Mark Davis deserved to win that match because he took slightly more risks and then he beat him again, and then you saw that all isn’t right with Neil because he lost a match that he should never have lost against Dechawat Poomjaeng in Beijing. Maybe he is longing for the long matches and had one eye on the Crucible because he’ll be very determined and if he has got his game back together – he is not going to win matches by just playing safe all of the time – I think at times this season he has almost gone the other way, he has gone from being the attacking player that has got a good safety game, to being a safety player waiting for chances to come and he’s too good for that. He has got to create his chances and after last year with his hundred hundreds, he has had a very quiet second half to the season so it might work in his favour. It all depends on how Robertson plays and if he is a little bit more adventurous. The match is longer and he can relax into it (he is probably not enjoying the best of 7’s much), I think he will win comfortably. PSB: And you hinted earlier that you think it will be Robertson or Allen to come through this quarter at this stage? NF: Yeah I do think that, I don’t see it going any other way, but the Allen/Day match, if I had to pick a qualifier who could go a long way in the World Championship, it would be Ryan Day for me. NF: The bottom line is I think that Mark Davis is doing really well, he beat Ken comfortably, he was tremendous against Robertson I thought in Llandudno and he beat him again. But you are right to point out that recent match and Ding has slipped under the radar a bit because he has been struggling, but he is still the player that he was last year, there is no change there. Again he is not a player who enjoys the best of 7’s so I think Ding has got a great chance of winning and could go all of the way. I think it is a horrible draw that he has got, with Higgins in there and they had that great match in Beijing that Ding won on the colours with an outrageous fluke on the last red to the middle pocket, but I think that Ding might go well this year. PSB: Obviously a lot has been said about Ding’s record at the Crucible, having only once got past the quarter-finals, do you think that plays any part? NF: That was the year that he lost to Trump wasn’t it, yeah that’s right that was his year. People talk about him as a future world champion but it has probably got to happen this year or next year or it will probably never happen. Time runs out for these guys who have been around as long as Ding, he has got a lot of miles on the clock, he’s not very old but he has been going a long time. 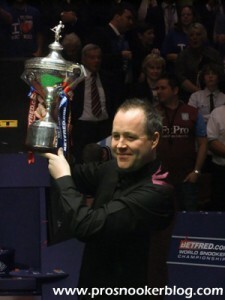 This could be his year, I honestly think that his build-up to the World Championship, as much as it has been wrong, in some ways…it’s a long time now but the year that John Parrott won it, he kept making the point that he was a fresh horse that year. He had not played much snooker, not figured and that’s one of the reasons that Parrott won it, because he had a lot of snooker left in him coming to the Crucible and I think that Ding is like that now. NF: I wouldn’t underestimate Milkins, he’s a bit of a difficult opponent at times because you don’t know what he can do. If you go back to Robertson, he was over-cautious when he lost to him a couple of years ago I thought and Milkins beat him, but John is playing a lot better now. John looks not the player he was, but he’s 80% of that and he has not been playing as well as that for a good two seasons. I like John’s game, I think that John knows too much for Milkins over the best of 19 frames at this venue having won it four times.
. So I think as much as I like Milkins, I’ve grown to like him a bit more, I played him once and I didn’t enjoy the experience very much because he is a bit of a fidget around the table, but I have grown to like Milkins as a person, I think that Higgins will beat him at the Crucible, fairly comfortably. PSB: And then we have Marco Fu and Jimmy Robertson, Jimmy another there for the second time having lost heavily to Selby on his first time. NF: I think that Jimmy is a very decent player, Marco is a player who is always tinkering with his game and I always say this but it’s true and he has got two ways, he is very Jekyll and Hyde. I remember his game against Matthew Stevens where he was shocking at the Crucible 2-3 years ago and they met I think the next year and I think Marco beat him. He can play badly at times but I would be surprised if he played badly in this tournament. He has been quiet recently Marco which makes me think that he might have gone away and had a little time to work on his game and we may see the good Marco Fu. So again, Robertson is a talented player, but Marco’s match game will be too strong. PSB: And then one of the other big names, Judd Trump is up against Stuart Carrington and it was interesting yesterday because Stuart was saying how when he was in junior tournaments, he used to play Judd quite a lot in the finals, being in a similar age bracket. NF: I didn’t realise that, I knew they were a similar age. I think Judd is going to have a good championship, I think that someone like Carrington coming through is a good draw for Judd isn’t it? Whatever their history is, I don’t know a lot about that, but it appears to be a pretty decent draw for Judd. He is brimming with confidence right now, I know that his loss in Beijing to John Higgins was quite difficult to take, no doubt because Higgins was sensational to win that match in the deciding frame. There is a part of me that thinks that you don’t want to win in China if you want to win at the Crucible, I think it is hard to win them both. So he was beaten at a fairly late stage, his game is in good shape and I think he is a big player this year, he’ll beat Stuart I think. The history that they have got between them is an interesting thing, sometimes that works in the lower ranked player’s favour if they have grown up playing with someone, it;s a bit of a leveller, so I take that on board, but I think that it is a good draw for Judd. 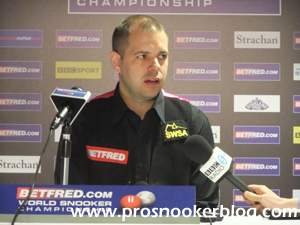 PSB: The last time that we spoke a year ago ahead of the World Championship, Judd was the one that you fancied to come through and it didn’t quite happen, but clearly he is one of the favourites to do so again this year. 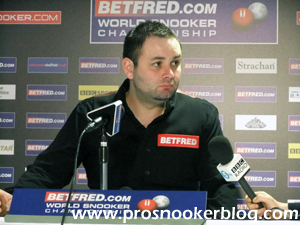 NF: I think that Judd is under-estimating his opponents less and less now, he is more respectful of the guys he is playing, he slips in a good safety shot every now and then, his win against Gould from 5-1 down was a sign that he had come of age to me. The way he played against O’Sullivan, he has been getting closer and closer to O’Sullivan and deserved to beat him that time. He will take a lot out of beating O’Sullivan at a major final and has to be on any shortlist for sure, I think he has got a terrific chance. It’s a shame that Judd and Ding are in the same quarter because I would give both of those two a chance. I think if they do both get there and Ding plays anywhere near his best it sets up a terrific quarter-final, given that Trump beat him in the semis when they met in 2011. That’s the toughest section for me. PSB: Can you pick someone to come through that quarter? NF: I am going to go with Ding, I just think that he is going to have a good World Championship this year. He and Judd, I think they could both win the title so whoever can come through that bit has a chance. I’m big on the chance of Robertson in the top half and I am quite big on the two that we have mentioned in the bottom half, Ding and Trump and am disappointed that they would have to meet in the quarters, although it would be a match to watch if it were to happen. NF: They play on the first evening and there is a chance that Graeme could beat Ricky, I don’t know the head to head but providing that it is not too quickly that Graeme is getting back into action, there are two ways that it can go, he could be a little flat after all of these matches or certain players could be a little bit sharper and I will come to one of those in a minute, but Graeme has got a chance in that match. He is quite a determined player. Ricky is all about class, he is underestimated Ricky, people don’t give him the credit he deserves, the fact that he has done all of his winning overseas is probably the reason for that isn’t it? NF: That was the year that he should have been in the final really, he was in front of Hawkins the whole match and on the last day Hawkins went by him didn’t he? PSB: Going back to Graeme Dott, you mentioned it earlier but it is a cases of horses courses with him isn’t it, always does very well at the Crucible. NF: I think it is a tough game that, it could go either way and I think I would just go with Dott possibly in a close one but that is against the odds really. It is a really tough game that could go close. NF: I think Bingham will win that game, Robbie has been quiet this season, a very talented player but he is probably tailor made for Bingham isn’t he? 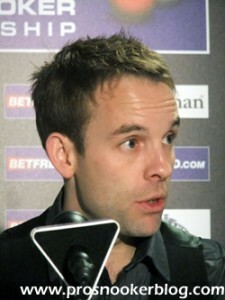 Stuart likes an open attacking game and he’ll get one against Robbie Williams, he is of a similar style. 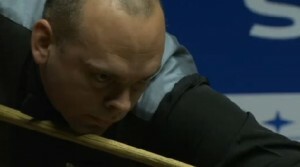 PSB: Yes, although they had a close match in Chengdu, Bingham winning that one 6-4. NF: Yeah and Stuart was very poor last year, he lost to Ken. He really was poor in that match and I hope that from his point of view that doesn’t happen again. He is another player who has been all over the shop but I think he will be fine with that, he doesn’t mind travelling around, playing all over the place. NF: He has been a bit up and down hasn’t he but I think it is a good draw, he will be pleased with the draw, he will be happy playing that sort of player. NF: Yeah the 2000 final, which Matthew could have won really. Matthew has been going through a tough time recently and I think you have got to give him all the credit in the world to qualify. Maybe he has been through the worst, I did his match with Joe Swail and it wasn’t a classic, but I don’t know if Matthew is somebody that practises long hours any more, so having played three long matches, which he has always loved, that might have really sharpened him up. These two have got history and again I don’t think that Mark Williams will be overly pleased to be playing Matthew, there is a lot of Welsh rivalry, these two are probably mates but there is a lot of rivalry between the Welsh and while Mark is in great form, that is going to be a close game, I think that will go all the way. They know each other too well for it to be anything else. That could be the match of the round. PSB: I did notice that Stevens hasn’t beaten him in a ranking event since 2003, but obviously Williams himself overcame a similar record against Ronnie O’Sullivan recently. 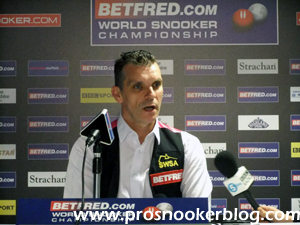 NF: I’ve got a lot of admiration for the way that Mark has been playing but he has played a lot of snooker in the last month or two and getting a few days off is all good and well but he has got to start again, get himself dusted and come again. I don’t know who will win it, I genuinely am going to sit on the fence, I wouldn’t guess that whole Welsh thing, leave them to it! NF: Yeah, Craig Steadman is a man who some people haven’t forgiven for ending Steve Davis’ career last year, I was watching that on the streaming in the end. But it’s a good draw for O’Sullivan. 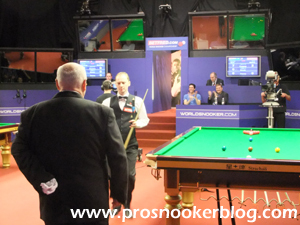 Steadman is a nice player but somebody like Graeme Dott, Mark Davis, Ryan Day wouldn’t have been a good draw for him. 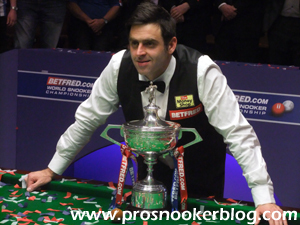 I suspect that’s a nice draw for Ronnie, he probably couldn’t have asked for anything better. 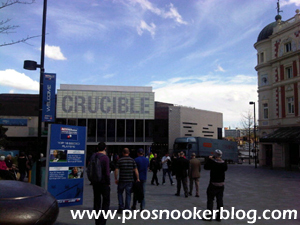 It’s a good draw for Craig in a way, he is at the Crucible and like they said with Hull last year, you never know how many times you are going to be there, he’s not coming in on the first day this year which is quite nice not to have to do that and he has got a big match, high profile which will get a lot of coverage in Europe, but Ronnie will beat him. I am not sure that Ronnie is in the greatest form and I am not sure that he will win the world title, but Ronnie will beat him and get his campaign up and running nicely, where he has got a tough game against either of the Welshmen in the next round. NF: It will be very interesting to see how he plays this year, if he had a sticky opening round match that wouldn’t have been great. I don’t think he has got one. He is playing someone that is inexperienced at the top level, he has got the perfect draw and it is down to Ronnie now isn’t it to prove that he has still got the stomach for it really. I’m sure he has, people have written Ronnie off before, like before he won those two world titles nobody thought that he would win another one and he could have won three in a row but for Selby last year. He has had a different season, he has played in a few more things, not playing in China would have helped him. He has got to be on the shortlist, but after last year losing in the final, I don’t know, I would like to see it but I am not certain that he will win it. He has got one or two difficult matches but if he could get his way through to the semi-finals and lets face it that quarter is not as difficult as the one above it, he has obviously got a chance. He could have a very tough match against Trump or Ding or anyone who wins, so if he can get to the semis he would have a tough game for sure. PSB: And if you had to pick one to come through that bottom quarter to win? NF: I would probably go with O’Sullivan to be honest with you. I would pick O’Sullivan but I wouldn’t be having my last £50 on it because Williams can beat him, he beat him in Chengdu recently. PSB: So looking at it globally, you are tipping Robertson from the top half and Ding from the bottom at the moment? NF: Yep, I would stick with those two for now, but with a big mention for Judd who I think has got a chance and in the top half Murphy, if he has got his game back together and recaptures his form from a few weeks ago, he would certainly be in there. If Selby can win it again and break the curse then all credit to him, but I would always oppose a first time champion going back, it’s tough isn’t it? The pressure that he has found, he has already admitted to feeling under pressure this season and there is more pressure on him at the Crucible and it is no shock that when you think of the best first time winners have been Joe Johnson and Ken Doherty, who nobody thought could go on to win it again really. Ken was in terrible form, I beat him in the UK Championship the year he was world champion, which shows you that he wasn’t in the best form! People expect Selby to do well and I think that the more expectation on a first-time champion, the more difficult it is so I would raise my hat to him if he can turn that around. fancying Professor Panda but tuff, very tuff.